Grandpa has been hiding a secret in the Potato cellar—a relic from a lost age of Ireland that leads to the world of the Others. The McGunnegals are all strange, and it has been that way for generations. They are too strong, or too fast, or too smart, and odd things happened when they are around. The neighbors say they are witches or devils, or have been snatched by changelings. Mothers hold their children close when they walk by, fearing they might catch the McGunnegal strangeness. But misfortune besets them when their mother, Ellie, disappears, followed by their crazy grandfather, but not before he reveals a family secret to Colleen and Frederick—a secret that reveals the source of their strangeness, and also threatens to cast the dark shadow of famine on Ireland. He has opened a portal to the world of the Others, where their mother has gone, and a dark creature—a goblin—has come in her place and is spreading death and disease. Grandpa has been hiding a secret in the Potato cellar—a relic from a lost age of Ireland that leads to the world of the Others, where the creatures of Irish legend still live on.They fall through this portal, and find this strange land filled with dark creatures that are crushing its people and now threaten to come through the portal and take up their abode in the world of Men, as they once did long ago. Yet in this dark world of oppression, this poor family discovers who they are, and also what it means to be truly human. 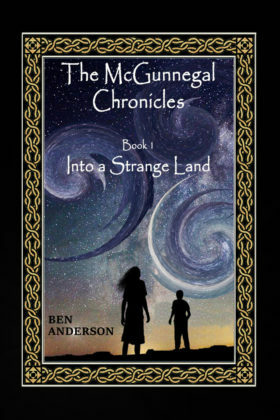 Book 1 of the The McGunnegal Chronicles series.